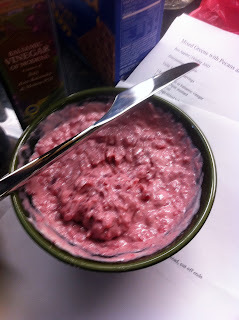 Just about every time we have a potluck where I work, Martha, a co-worker, brings a batch of her dee-licious veggie dip. Black beans, minced peppers, onions and cilantro tossed with a touch of lime and a few drops of Tabasco. Served with tortilla chips, it's a meal in itself. She calls it Seviche. Seviche? Isn't seviche (pronounced say-VEE-chay) the stuff where non-kosher-type sea thingies are "cooked" by a bath of citrus juice? Just before I headed to sunny CA for the wedding shower weekend, I asked Martha about the origin of the name. You see, she was born in Colombia, so I just assumed the dish originated from there ... and you know what happens when you assume. Shocked ... shocked I say, I was wrong. Martha got the recipe from a friend, and she called it seviche. "Did you know," Martha continued, "that you can also make seviche with chopped mangoes?" I finally got it. It's a salsa. 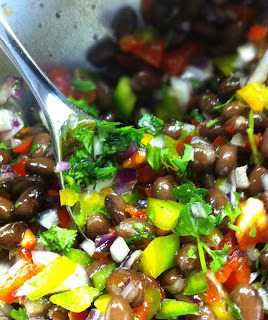 Black bean salsa! This past Sunday was End of Chemo/Bridal Shower Picnic! I got up early to start on the picnic provisions. No sacrifice there since after 4 days I was still on east coast time; my body thought it was a lazy 9am EST instead of OMG 6am PST. A quick check to see if the cupcakes made on Friday were still good -- yup ... the advantage of better living through chemistry, I mean thank you Duncan Hines and BridesmaidOne! By 10, MaidOfHonor, who was given the responsibility of picking up the deli meats, called to say that "they" were out of kosher roast beef -- should she pick up pastrami instead? Pastrami sliders with horseradish sauce might be delicious. And there are people out there who like pastrami sliders with horseradish sauce. But they were not invited to the Shower Picnic, so we said get more turkey and show up by 11. I picked the right weekend to be in sunny CA. My house, hubby and dog (not necessarily in that order) managed to stay safe and dry; my backyard fallen-tree-free. But many, many others in neighboring towns weren't so lucky. To all my NJ and VT friends, I hope the floods have receded from your basements and/or streets and that your power/internet is back on. Back to happy weekend. Although we got this extended party started on Thursday with dinner at the local sushi bar, the real partying commenced with an ever-so-fancy afternoon tea at a veddy posh Beverly Hills hotel. 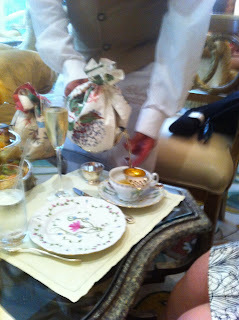 A harpist gently played soft standards while we daintily sipped tea. Teensy-weensy open-face sandwiches, pastries and scones were served on tiered silver trays.